As the only current female member of the Bomb Squad, Constable Michelle Rybarczyk says that joining is one of the best career moves she’s made. Michelle joined Tasmania Police in 1999, having wanted to be a part of the service since high school. After stints on the Burnie Watch, Crime Management Unit and Burnie CIB, she was encouraged to apply for a secondary role in the Bomb Squad by a colleague in 2005. At that time she didn’t know much about what secondary roles were available, including Bomb Squad, but thought the role and equipment sounded interesting. “The Basic Bomb Technician course has been the most challenging course I’ve completed. There is a lot of specialised equipment to learn how to use and maintain, and the role requires sound problem solving abilities and lateral thinking. “One challenging aspect is the mental side of wearing the bomb suit; it can be claustrophobic for many people as the suit is very restrictive and quite heavy,” she said. A lot of Michelle’s Bomb Squad duties involve collecting old explosives from properties or army ordnance like grenades and artillery shells that people dig up in their garden. Clearance searches of venues for visiting dignitaries and attending to suspicious packages also form part of the role of a bomb technician. “We also do a lot of extensive training to prepare for possible large scale incidents and to keep abreast of national and international trends,” she said. Part of this training also involves conducting controlled explosions and re-creating improvised explosive devices identified in international incidents. “Handling and blasting explosives is something completely different to my normal work role, which I really enjoy,” she said. Michelle moved to Forensics in 2010, which she finds works really well with her Bomb Squad role. “To be honest, I’ve never felt like I couldn’t do my role just because I’m a woman. I’m proud to be in the Bomb Squad – I’ve always felt if I can’t do the job, then I don’t expect to be awarded a position,” she said. 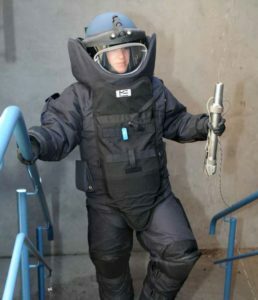 Above: Constable Michelle Rybarczyk in her full bomb squad protective suit. This page -- https://www.police.tas.gov.au/about-us/100-years-women-policing-tasmania-police/women-specialist-roles/making-explosive-career-choice/ -- was last published on February 13, 2018 by the Department of Police, Fire and Emergency Management.